Yes, Robin Williams passed away & it is sad. I am not his biggest fan (as I am not a big comedic lover) but I love the movie “Dead Poet’s Society” when I first watched it as a teenager. Mainly because I wished we had a teacher like him in the movie so that our classes will be so much fun. I can’t remember the part where he said the those words to his students but now that I am older & many reads after, I can’t but agree more. If there’s anything I wish that I could do better at when I was young – it will be mastering a language that you like through reading all types of writing (poetry, classics, fiction, fantasy, sci-fi, comic, adventure, horror, magic ..whatever!) then explore writing not in just the usual boring daily journal entries but write about feelings, experiences, lies, imagination, dreams, fears, joys, angers not just through paragraphs, but through rhymes, poems, prose, speech, metaphors, stories .. whatever! As this is the surest way to master in articulating your true feelings to justice. 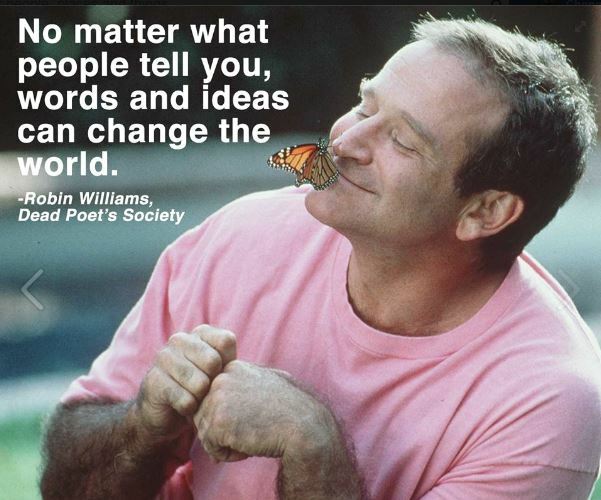 Robin Williams is right that words & ideas do change the world! And only those who can truly use words to convey those ideas with such finese are the ones that can ‘move’ people. So well delivered with simple words. But one truly gets it.